In this post we take a look at how to deploy your Angular 2 app as a Docker container to IBM's Bluemix and the light configuration you need to do to make it work. Over the last few months, I’ve done quite a lot of Angular 2 development (now Angular 4). Below is a description how to create a new Angular app and deploy it as a Docker container to Bluemix in just a few minutes. In order to create a new Angular app, you can use the Angular CLI. There are several ways to deploy Angular apps to Bluemix. For example, you can build a simple Node.js web server to host the files. Or you can leverage existing HTTP servers like Nginx. You can use Nginx in the Cloud Foundry staticfile-buildpack or in Docker. Since I experienced issues with the Cloud Foundry buildpack (I couldn’t enforce HTTPS), the following steps show how to use Docker. Copy the following lines in the file ‘Dockerfile’ in your project’s root directory. Copy the following lines into ‘nginx.conf’. There are many other features Nginx provides that can be configured in this file, e.g. GZIP settings and caching. The location ‘/api/v1/namespaces/’ is an example how to invoke a REST API from your Angular app, in this case, to invoke an OpenWhisk action. Next, the Docker container needs to be built. 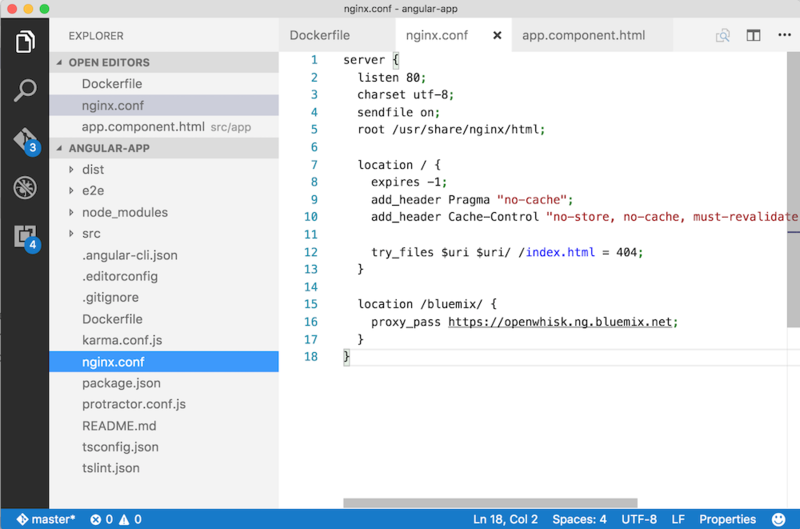 docker build -t angular-app . This is the file structure of the Angular project.